Chenango Forks High School (Binghamton, NY). 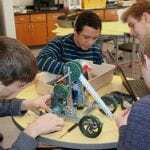 Chenango Forks High School opened its new STEAM Academy in January 2018. The Academy offers individualized pathways that address students’ diverse career interests, learning styles, and schedule. The Academy partners with several colleges/universities to offer Advanced Placement and career opportunities, including Spanish for the Professions, Residential Construction, Early Childhood Development, Computer Programming, and Mastering the Message. At Chenango, the only certified Work Based Learning High School in Central New York, students may earn the additional graduation credential of the Career and Technical Endorsement designation. Through the STEAM Work-Based Learning Cooperative Opportunities, 11th grade students shadow professionals, while 12th grade students participate in an on-the-job co-op with local businesses. Chenango Forks gives students a wide variety of options to acquire the essential skills and knowledge needed to flourish in today’s world. This website has been funded, at least in part, with Federal Funds from the U.S. Department of Education under contract number GS-02F-0072X. The content of this website does not necessarily reflect the views or policies of the U.S. Department of Education nor does mention of trade names, commercial products or organizations imply endorsement by the U.S. Government.